The all new Apogee Ensemble is the first Thunderbolt 2 audio interface to offer superior sound quality, the lowest latency performance and the most comprehensive studio functionality all in one box. Ensemble includes 8 Advanced Stepped Gain mic preamps, monitor controller functionality including talkback, front panel Guitar I/O, two headphone outputs and digital connectivity for a total of 30 x 34 I/O. The Apogee Ensemble is an industry leading Thunderbolt 2 audio interface for Mac. Accommodating for either professional or home studio use, it features an exceptionally diverse range of capabilities. The Ensemble is a mighty audio force thanks to its expansive connectivity, premium design and build and notoriously faultless Apogee converters. 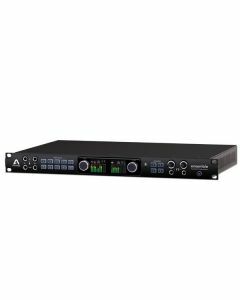 Four XLR mic/line inputs, two ¼” high impedance instrument inputs with Class-A JFET input stages, four combi mic/line/instrument inputs, 16 channels of ADAT, eight channels of SMUX and four channels of S/PDIF, all on Toslink, a further two channels of S/PDIF on coaxial, two ¼” balanced analogue inserts and Work Clock on a BNC connection mean that the Apogee Ensemble is positively bursting with inputs. In terms of outputs, the Apogee Ensemble boasts two ¼” balanced monitor outputs, eight balanced outputs on 1 DSUB 25-pin connection, two ¼” stereo headphone outputs, two ¼” dual-mode instrument outputs, 16 ADAT outputs, eight SMUX outputs and four S/PDIF outputs, all on Toslink, another two S/PDIF outputs on coaxial connectors and a Work Clock output on BNC. Up to 75dB of gain, stepped gain control, 48V phantom power, HPF, soft limiter and polarity inversion all come as standard on each of the eight microphone preamps on-board the Apogee Ensemble. For talkback functionality, a mono omnidirectional microphone is built into the front panel. The Apogee Ensemble’s proprietary Thunderbolt audio driver and ESS Sabre32 DAC offer ground breaking low latency performance. Mac CPU is also freed up with the Core Audio-optimised hardware – this pairing suddenly makes the Apogee an exponentially more powerful unit. Additional features of the Apogee Ensemble include 24bit/192kHz audio, dual high-res OLED displays for level and settings info, input select buttons and controller knob for parameter and settings control and hardware parameter control via Apogee Maestro software.